Remember when hosting a simple family get together, it could be broken down into planning, preparing, cooking, cleaning up, and heading to bed. Having the family over for a party might seem like an easy task at first, but any seasoned party host knows that Thanksgiving traditions can grow into a daunting task. But, when all is said and done, there is no reason why you shouldn’t enjoy your holiday party as much as your guests. It’s time to break the mold and figure how to tackle the party beast without losing your sanity. And maybe, just maybe, actually have some time to share lasting memories with your loved ones. 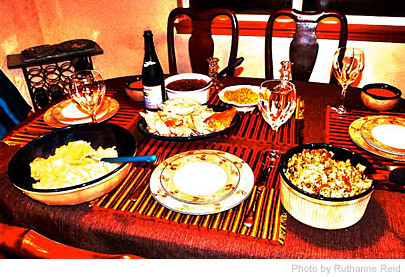 Here are some quick Thanksgiving party ideas to make it a memorable family holiday. If you want your Thanksgiving party to be a success, you can’t afford to run out of food, especially with a bunch of active kids around the house. Stock enough food for unexpected guests and for adults who let the holiday spirit get the better of their dietary resolutions. Consider serving the traditional foods – turkey, ham, mashed potatoes and all kinds of pies or you could go the untraditional route and devise your own menu for the holiday. You can always freeze the leftovers and eat them over the next few days –that in itself is a time-honored Thanksgiving tradition after all! Thanksgiving is most people’s favorite time of year; not just for the food but also for the wonderfully fall flavored drinks that are associated with this holiday. If you’re feeling lazy or want to keep it simple, pick just the one drink that goes with the meal and stock up on it. To keep it simple, serving kid friendly drinks like pumpkin butterbeer or apple cider. Stock up on a fun selection of items and keep them cold in an easily accessible ice bucket or refrigerator. It’s your party, after all, and you don’t want to have to be wasting time worrying about drinks while everyone is socializing. Styling your house for a family Thanksgiving party does not need to cause an economic crisis. With a little imagination and loads of creativity you can use and reuse objects from around the house or from nature to brighten up your home and welcome your loved ones. For instance, you could use pretty throws and scented candles; light your fireplace; core small pumpkins and apples to create unique candle holders and inspire your kids to create original centerpieces. All of these take minimal time and effort and cost next to nothing but they will create a beautifully warm and cozy atmosphere for the holiday. Ultimately, the best Thanksgiving party idea is to invite just the right number of guests so that you are not being overwhelmed by planning and preparations. Ideally, you don’t want your guest list to get out of hand and become more of a mob scene than an intimate and meaningful family gathering.